The projected path of Hurricane Isaac, and its aftermath, as of 1 p.m. CDT Aug. 28. “Storms that have caused the most widespread damage and flooding in our area have been hurricanes or tropical storms that have come off the Gulf Coast and either bring a lot of force and a lot of water with them and pass through quickly or they’re not strong enough to blow through the area but the system stall and breakup over the St. Louis area dumping inches of rain for hours upon hours,” LeComb said. MSD is working to make sure it has enough staff on had to respond to any problems over the weekend, LeComb said. In 2008, the remnants of Hurricane Ike caused major flash flooding in parts of the metropolitan area. A long-delayed buyout of 26 properties in University City that were severely damaged by flash flooding in 2008 has gotten a final level of approval. 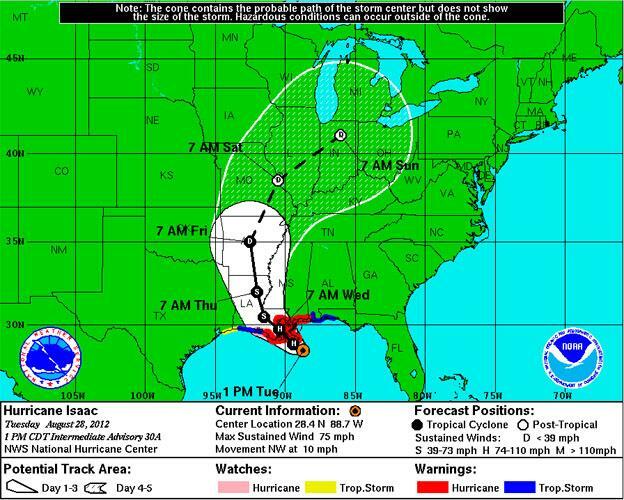 Tropical Storm Isaac has dismantled Illinois Republican’s convention plans. With national convention events canceled, they're no longer spending Monday nominating Mitt Romney as their candidate for president. That leaves an opportunity for them to focus on state politics. 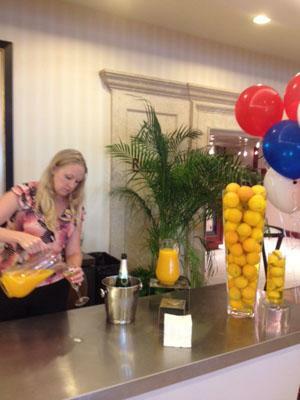 Illinois Public Radio's Amanda Vinicky reports from the Republican National Convention in Tampa.